I love seafood. When we go home to Florida, that is maybe what I look forward to most. Right after our family. Oh, and those beautiful beaches. OK, so it is 3rd on my list. We usually get home once a year, for one week, so for the rest of the year I’m here in North Carolina. Lots of lovely restaurants here, but you just can’t compete with a town right on the Gulf of Mexico, now can you? I’m sorry for the crummy picture, sometimes I forget to snap one until too late and have to do a rush job. 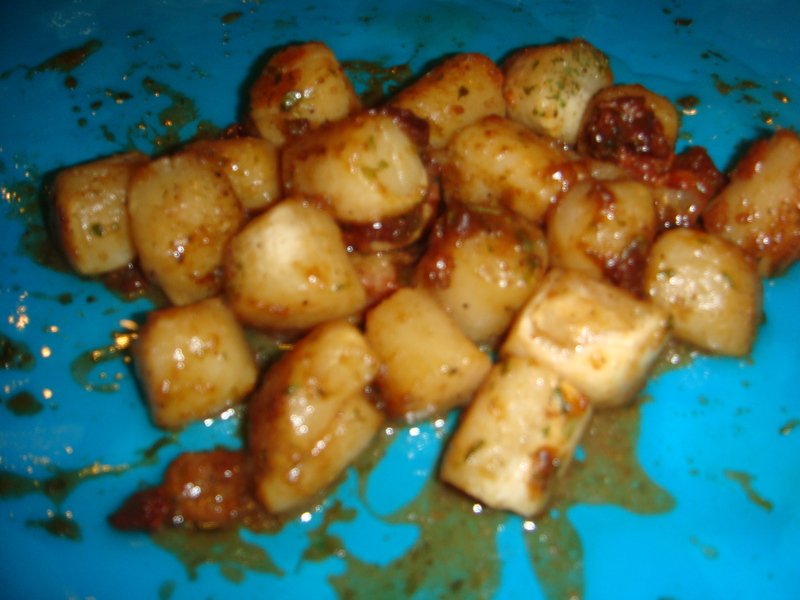 Plus, as you can see, these were frozen scallops, so have some of that discoloration that looks like freezer burn. It didn’t matter. They were absolutely delicious! This recipe came to me as an appetizer, but I put them over pasta noodles I’d tossed with a little butter and Parmesan cheese and made them into a full meal.